Aspiravi is growing steadily, for 16 years now. It is constantly growing on a variety of levels: the number of wind turbines that we build, our total installed capacity and the green electricity that we generate, the number of employees that realize our projects and the number of cooperants that invest through the CVBAs (cooperative companies with limited liability). Our growth goes hand-in-hand with the increasing Flemish, Walloon, Belgian, European and global demand for renewable energy. ... Aspiravi was officially founded on April 30th 2002. ... 96 Belgian municipalities are shareholders of Aspiravi Holding. ... In 15 years, the number of employees grew from 5 to 100 for the entire group. ... More than 9,625 cooperants invest in our renewable energy projects and in this way enjoy the yields of wind energy. ... The total installed capacity of all installations the Aspiravi group is involved in, amounts to 1,005 MW, which is the production of green electricity for more than 900.000 households. ... 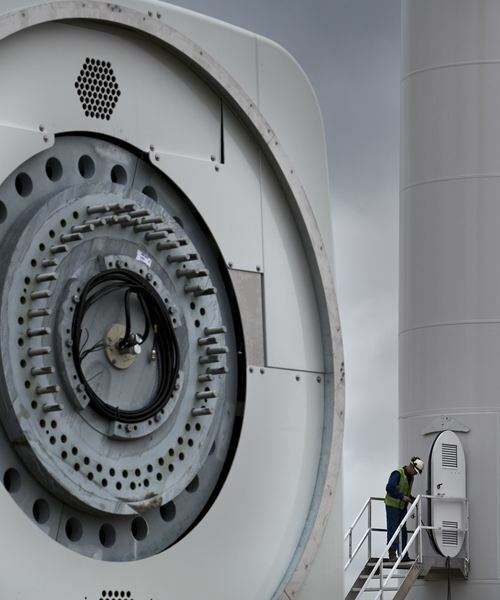 The Aspiravi group is involved in the management of 306 wind turbines on land and at sea, in Belgium and abroad. ... Thanks to the renewable energy our installations produce, we reduce the emission of CO2 with 1,400.000 tonnes every year, which equals the emission of ± 645.000 cars.